Check it out! This video was taken at approximately 11am today from a fire operations helicopter flight near the southwest corner of Howe Ridge Fire. The smoke is a combination of the small burnout operation and the fire moving through the dense understory. Most of the smoke is the fire burning dead trees left over from the 2003 Robert Fire, which was in this same area.Fire managers are using the burnout operation to reduce vegetation between the road and the active fire to hold the current containment line along the Inside North Fork Road. This is a common wildland firefighting tactic and is being used before the predicted wind this afternoon. 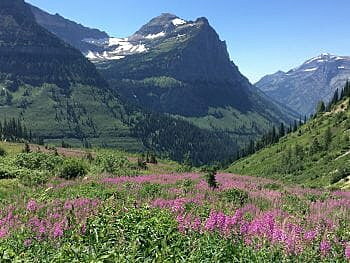 Once again, visitors to Glacier National Park will have a chance to witness the spectacular vistas afforded by the west side of Going-to-the-Sun Road. Starting Friday, some park-operated and concessionaire vehicles will be allowed on the road between Apgar and Logan Pass – the popular scenic stretch closed by a wildfire since Aug. 12. At this time, no private cars will be allowed on the road – and the few vehicles provided access will not be allowed to stop between Apgar and the pass. Firefighters and park rangers are placing strict limits on the access because the 13,037-acre Howe Ridge fire continues to burn actively in close proximity to the road. For the Sun Road’s partial reopening, visitors will be required to use either Glacier Park’s free shuttle bus or a private tour bus to travel the west side route. Each day, beginning at 7:30 a.m., park officials will distribute a limited number of free park shuttle passes at the Apgar Visitor Center Shuttle Stop. The passes will be given out on a first-come, first-served basis. The park has not released the specific number of passes that will be available. Shuttles will then leave from the Apgar stop every 30 minutes until 1:30 p.m. The last shuttle will return to Apgar from Logan Pass each day at 4 p.m. Visitors will also have the option of traveling to Logan Pass on the concessionaire-operated Red Bus Tours or Sun Tours. Those services are operated at a fee. To make reservations with Sun Tours, go online to the Sun Tours website. Reservations for a Red Bus Tour are available at the Glacier National Park Lodges website. The Going-to-the-Sun Road remains open to private vehicles from St. Mary to Logan Pass, on the east side of the park, as it has since the Howe Ridge fire was ignited by lightning on Aug. 11. On Thursday, incident commander Mike Goicoechea saidthe fire remains active over a wide area as it burns through heavy lodgepole regeneration from the 2003 Robert fire. Goicoechea’s Northern Rockies Type 1 Incident Management Team recommended the strictly controlled access to the Sun Road’s west side because a considerable number of firefighting vehicles continue to use the road – and the fire itself continues to pose a threat to public safety. A day after it ignited, the fire burned more than a dozen historic cabins and other structures on the north end of Lake McDonald. Less than a week later, it prompted the closure of Lake McDonald Lodge for the season, more than a month earlier than usual. Earlier this week, firefighters completed a burnout operation along the Inside North Fork Road, which is being used as a fireline. So far, the fire has been held at the Inside North Fork and at the Sun Road. Crews have also cleared the North Lake McDonald Road of hazard trees created by the Aug. 12 firestorm that destroyed the cabins and prompted evacuations that remain in effect. Hazard trees will also be removed along the Inside North Fork Road. Temperatures on the fire were in the 70s on Wednesday and the same was expected Thursday. The management team’s latest report said a cool front is expected in the area starting Saturday, with lower temperatures and minimal winds.